Executive Chef James absorbed his southern cooking education at an early age in small town Alabama kitchens. These rich experiences have shaped his style and reinforced his career path. In 2006, shortly after moving to Texas, Chef began working at the Northwood Country Club under the culinary influence of Executive Chef Michael Scott. While excelling in the culinary field at NCC, Chef James furthered his culinary knowledge by completing the culinary arts program at The Art Institute of Dallas in 2008. 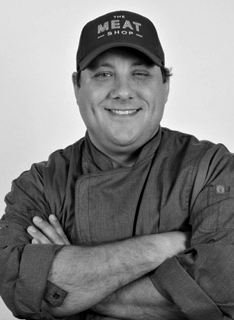 In 2009, Chef joined Executive Chef Salvatore Gisellu's team in opening Urban Crust in Plano. Here, he helped execute the owners' visions for elaborate menu items, food cost and management, and VIP dinner pairings. Chef James helped contribute to the success of the restaurant in only it's first year of business. Chef James looks forward to this new venture on his culinary path and creating a successful butcher shop atmosphere for you and your neighborhood; for our neighborhood.